In an article published in the journal Environmental Pollution, Brazilian researchers showed that tree species Tipuana tipu have been successfully employed as a marker of atmospheric pollution by heavy metal and other chemical compounds in Sao Paulo, Brazil's biggest metropolis. This Bolivia-native species commonly known as tipuana tree is ubiquitous in the city. Researchers at the University of São Paulo's Bioscience Institute (IB-USP) and Medical School (FM-USP), in collaboration with colleagues at the University of Campinas (IB-UNICAMP), have considered T. tipu the most suitable tree for measuring environmental pollution levels in São Paulo over the long term by analyzing the chemical composition of tree bark and growth rings. Tests were carried out in order to compare the performance of three of the most common tree species in the city: privet (Ligustrum sp. ), sibipiruna or partridgewood (Caesalpinia pluviosa), and tipuana. With the support of São Paulo Research Foundation – FAPESP via a Thematic Project , a regular research grant and a postdoctoral research scholarship, the research attested a reduction in the levels of pollution by cadmium, copper, nickel and lead in the west of the city in the last 30 years. The roots of the tipuana tree absorb heavy metals and other chemicals that are present in the atmosphere and fall to the ground in rainwater. These chemicals are transported in sap by the tree's xylem cells and stored in the wood of its growth rings – those concentric circles visible in a cross-section of the trunk. Each growth ring represents a year of the tree's life. The more recent rings are wider and farther from the center. Those closest to the center are narrower. The chemical composition of the tree's growth rings reflects the levels of heavy metals in the soil year by year, and the results can be compared to determine how this type of pollution has varied on a scale of decades. "If a tree is 50 years old, for example, it will tell the story of pollution in the city during that period," said Giuliano Maselli Locosselli, a postdoctoral researcher at IB-USP and first author of the study. All the while Tipuana bark analysis shows the levels of atmospheric chemicals that have been passively deposited in this external part of the trunk. By measuring the levels of heavy metals in samples of bark from trees still standing in different neighborhoods of the city, the researchers can map spatial variations in these levels on a scale of years. "It's easier to obtain samples of bark than annual growth rings, and the chemical analysis of bark is less costly, so we can analyze samples from many trees and cover a large area", said the FAPESP scholarship holder. "The result is a map of pollution by heavy metals and other chemical elements throughout the city." The researchers conducted an initial study in which they measured the levels of cadmium, copper, mercury, nickel, sodium, lead and zinc in rings from two tipuana specimens growing in the gardens of the University of São Paulo's Medical School in the west of the city's central region. Their goal was to analyze the temporal changes in the levels of heavy metal pollution in this part of São Paulo. The two trees used in this study were 35 years old. 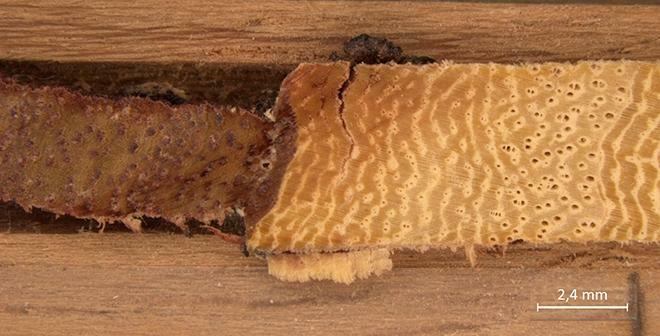 Samples were taken from their growth rings using an instrument called a Pressler increment borer, which has a hollow auger bit and is designed to extract a cylindrical section of wood tissue from a living tree throughout its radius with relatively minor injury to the plant itself. "The procedure can be compared to a tree biopsy," Locosselli said. The 15-mm annual growth ring samples were sent to Marco Aurelio Zezzi Arruda, a professor at the University of Campinas's Chemistry Institute (IQ-UNICAMP). There, the samples were scanned by laser ablation coupled with mass spectrometry, generating software-processed images for chemical analysis. The researchers selected the cells of interest and performed a continuous analysis of all the annual growth rings to measure the levels of heavy metals absorbed by the trees in each year of their lives. The data analysis pointed to a significant reduction in pollution by cadmium, copper, nickel and lead in the last three decades in the part of the city inhabited by the sampled tipuana trees, as well as a more moderate decrease in the levels of sodium and zinc. "The falling levels of lead reflected the gradual elimination of this chemical element from the composition of Brazilian gasoline," said Marcos Buckeridge, coprincipal investigator at the FAPESP Thematic Project and a coauthor of the study. "The downtrend in cadmium, copper and nickel pollution probably reflects enhanced vehicle efficiency and deindustrialization in São Paulo," Buckeridge said. Tetraethyl lead was used worldwide as an antiknock agent in automotive gasoline for much of the twentieth century to improve engine performance and reduce wear. The resulting release of lead into the atmosphere via vehicle exhaust was a severe health hazard. Brazil banned the addition of tetraethyl lead to automotive gasoline in 1988. The main sources of cadmium in ambient air pollution are the electronic appliance industry, pigments used in paint and dye, batteries, photography, lithography, fireworks, plastic, semiconductors, solar cells, fuels, urban garbage, tire rubber, and electroplating. The main sources of copper emissions are the burning of urban and industrial waste, metal alloy casting, and pesticides. "The levels of these chemical elements in São Paulo's ambient air have fallen in recent decades owing to deindustrialization," Locosselli said.